Posted on October 30, 2013, in Exchange, Office 365, Outlook, SharePoint and tagged email, Outlook Web Access, Outlook Web App, OWA, Page Viewer, SharePoint 2013, Web parts. Bookmark the permalink. 17 Comments. 1) Go to Web part Gallery. 2) On Web part Gallery page, Click Files-> New Document -> New in the ribbon. 3) On New web part page(NewDWp.aspx), look for Microsoft.SharePoint.Portal.WebControls.OWAInboxPart , Select the web part and click on populate gallery. ﻿﻿﻿﻿Now, you can go to your SharePoint page where you want to add web part, click on Add web part. Under Miscellaneous Category, you will see OWAInbox web part. Similarly, you can add OWA: Calendar, Task web parts etc. Thanks for posting this information Mohammad. I was able to follow your post (comment) and get the OWAContactPart in my gallery and put it on my personal sharepoint page. But I am getting a 404 inside my OWAContactPart. Is there a way you can help me configure correctly? Doesn’t work with latest patches and versions of Office 365 as they are sending X-Frame-Options setting as sameorigin in page headers, causing any solution utilizing iframe fail. This is a server side setting so it can’t be overridden if your Office 365 site is shared with other users. You can override this setting (which may not be aligned with your company security policy) if you have an on premises or exclusive online Office 35 server. What do you recommend me to retrieve the user inbox in MySites SharePoint 2013(on premise) knowing that I dont have Exchange administrator user ? I don’t think there’s anything I can recommend, that was the findings presented in my article. I’m not sure if any of the technology has changed since I originally wrote it but I reached the frustrating conclusion that it just wasn’t possible to do it reliably. The only partial success I had was to use the Page Viewer web part to include OWA in an iFrame as presented in the article step by step guide of how to setup the Page View control to connect to Exchange Online (OWA) take a look at this article by Jesper_Osgaard. I still had issues with authentication and sometime it worked, sometimes it didn’t. THat’s the only direction I can point you in but as I say I didn’t find it reliable in my environment. Good luck. please, after using the owaInboxPart , How to bypass the authentication and open user inbox direct without entering username and password in sharepoint 2007 or any version ? (I want to bypass entering of user information “username and password” as it is entered when I opened the Sharepoint site) for all the users. Ensure the owa site is a trusted site in IE. Also ensure that the user has cached their credentials. You really need to get to the point that a user can go to the owa site directly in a browser and be logged in automatically. 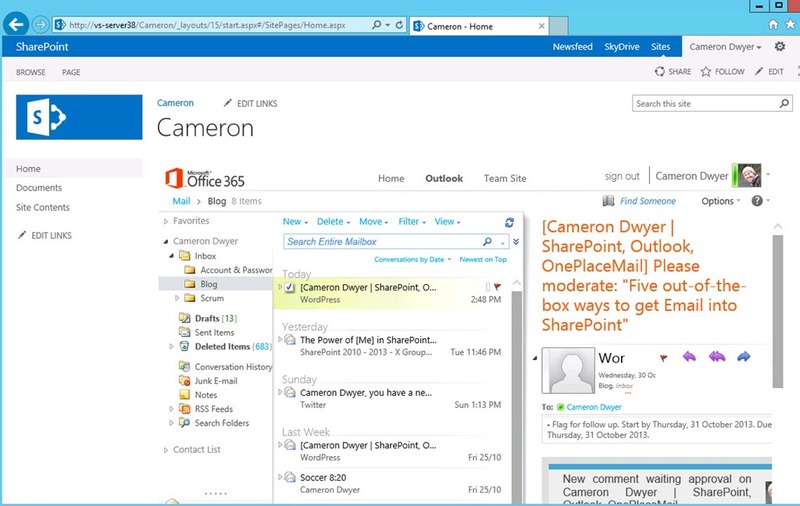 Then addressing via SharePoint should let the user to straight through. 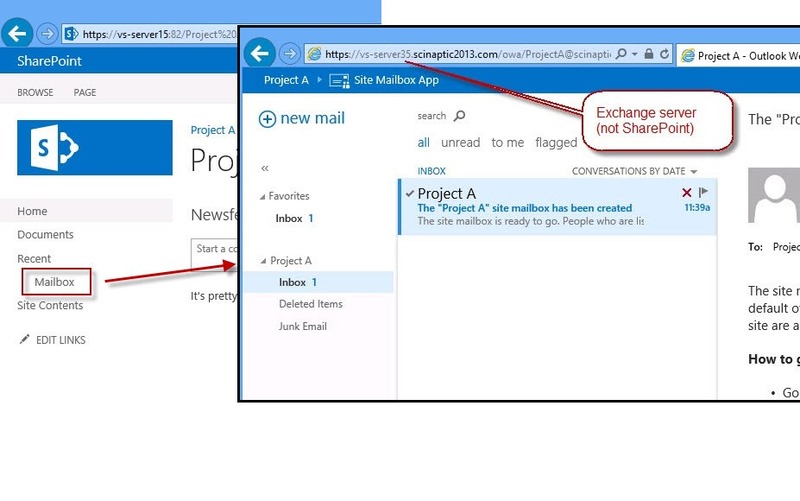 I always found that authentication and security issues plagued getting mail exposed on a SharePoint site. Now with Office 365 with a unified user identity across the SharePoint and Mail services the issue has largely been removed. Excellent article. Very well organized content. Clean format. I have a bit different scenario- We have an on premise SharePoint 2013 farm. I need to send a column value from a list form to Exchange 2010 public calendar using SharePoint 2010/2013 workflow. I understand and am aware that public folders are going away but for now I do need to send list data to these Exchange 2010 public calendar. If I understand you correctly you need to create a calendar entry in an Exchange public calendar from a SharePoint workflow. I assume you are able to get a handle on the SharePoint item in the workflow and read the required column values and the main issue is how to create the calendar entry? Unfortunately this is not something I’ve tried to do in the past. I’m not aware of a way to simply send something to an address that will have the item appear in the calendar (although it may be possible). In my experience you could achieve what you are after using Exchange Web Services (EWS). Your workflow would need to programmatically call EWS and create the calendar entry. Yes, that’s the approach I was thinking. Good luck.